Gear Update! « 1 guy. 2 bike trips. Well after my last paycheck I decided it was time to bite the bullet and start buying some gear. 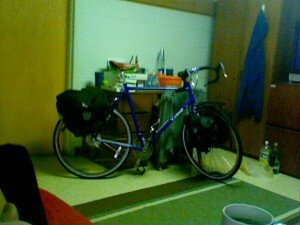 I needed racks, panniers, clothes, and camping equipment. For the racks I settled on Jandd for both front an rear. For panniers I decided to go with cheap ones from Nashbar that I will probably replace with Ortliebs in a few years when I can afford it. For camping Michael and I decided we would try to share a 3 man tent instead of getting two one mans, both for the weight and money savings. I decided on the Marmot Limelight 3 after scoping a few tents out at REI. I alsowent ahead and got the MSR Whisperlite stove. Other than a few odds and ends, I’ve got all the equipment for the trip. 1 comment to Gear Update! You will enjoy the WhisperLight, I have heard really good things about that stove (ironically all shortly after we went to REI). Apparently it does really well at all altitudes and the white gas should serve you better than compressed cans as it will be 10x easier to get on the road.